All the pre-match hype was about Fernando Torres and, to a lesser extent, Raul Meireles facing their former club but it was Glen Johnson, another player to represent both sides, who settled the match in the closing stages with a delightful individual goal. That goal sealed all three points for Liverpool after substitute Daniel Sturridge had cancelled out Maxi Rodriguez's first-half opener. The win moves Liverpool one place up to sixth, level on 22 points with London trio Chelsea, Tottenham and Arsenal, though Spurs will have a chance to move up as they face Aston Villa on Monday night. It is the Blue's worst start in the Roman Abramovich era: they have not lost four matches in their opening 12 games since 2000/01, and it's also the first time they have suffered back-to-back home defeats in the league since 2002, the year before Abramovich took over at Stamford Bridge. The big team news before kick-off was that neither Torres nor the man who replaced him at Anfield, Andy Carroll were starting the match in west London. The two men cost £85 million between them on transfer deadline day in January, and have since scored just five goals each for their current clubs. Andre Villas-Boas acted decisively at half-time by replacing Mikel with Sturridge, leaving Torres on the bench. 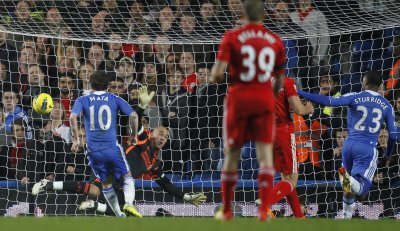 The Blues set about their opponents with renewed vigour, and were rewarded 10 minutes after the restart when the impressive Malouda surged into the box and hit a low cross between Reina and his defenders that Sturridge turned in for his sixth goal of the season. It was only Reina that stopped Chelsea going ahead two minutes later when he got down low to parry Luiz's glancing header with an excellent save. Malouda fired wide with an agile overhead kick before he volleyed across the face of goal, leaving the waiting Lampard and Mata putting their hands to their heads in dismay. Kenny Dalglish brought on two substitutes - Jordan Henderson and Stewart Downing - before Villas-Boas finally brought Torres and Meireles on six minutes from time. That double-switch was largely ineffectual, and they were only on the field for a few minutes before Johnson eclipsed them both. The England right-back - who moved from Chelsea to Anfield via a two-year spell at Portsmouth - picked up the ball on the right wing and nipped past Ashley Cole into the box, held off the covering Malouda before passing an inch-perfect low finish into the far bottom corner past Cech and Terry on the line.